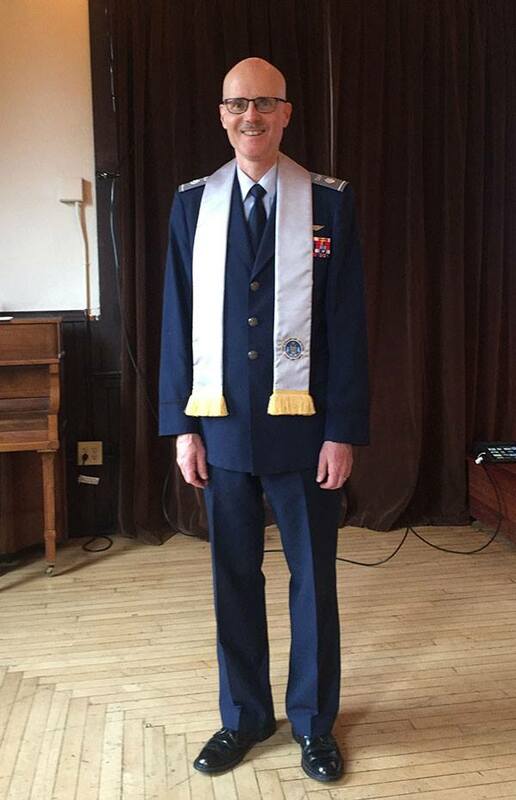 Deputy Chief of Chaplains, Chaplain (Lt. Col.) Charlie Sattgast models the silver side of the new Civil Air Patrol chaplain stole / scarf which he wore during CAP Sunday in December 2016. 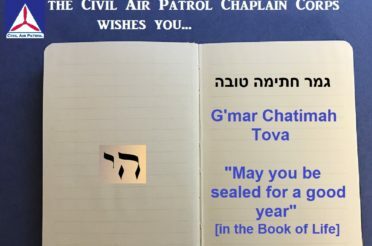 During the months of January and February 2017, the first shipments of a new, optional Civil Air Patrol chaplain scarf / stole were sent to some chaplains who are making the choice to wear the vestment. The first publicly available design will be reversible navy blue and silver gray satin with a gold fringe at the ends. Both sides feature the embroidered CAP Chaplain Corps crest. The vestment first debuted in the Virginia Wing during Civil Air Patrol Sunday/Weekend in December 2016. Other chaplains from around the United States also wore the test models during that time. The stole made its appearance again at the 2016 Wreaths Across America event in the Washington, D.C. area. Since its initial release, CAP chaplains have worn it to numerous public and CAP events. These garments are worn while conducting religious ceremony or prayer with any CAP uniform combination. 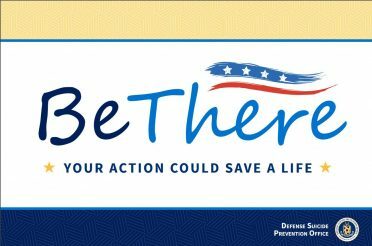 The generic nature of the design makes it suitable for CAP Chaplain Corps clergy from any denomination or faith who choose to wear it. 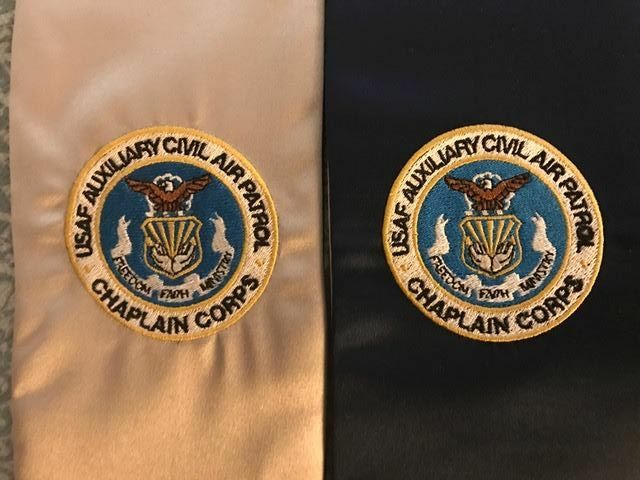 Both sides of the new Civil Air Patrol chaplain’s stole/scarf are embroidered with the crest of the corps.wear it. 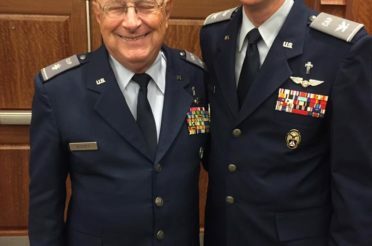 The new uniform item is solely for Civil Air Patrol chaplains. The scarf took over eight months to design, test and produce with the manufacturer, C.M. 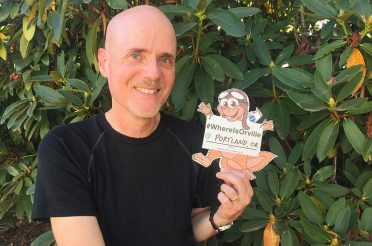 Almy, who is the largest supplier of vestments in the United States and the source of stoles for U.S. military chaplains. There are still scarves available to purchase from the initial bulk order for the cost of their manufacture. The vestments are in Virginia awaiting their new owners who can procure them by emailing tminer@hc.cap.gov. This article first appeared in the Winter 2017 issue of The Transmitter.